Alliance for a Living Ocean (ALO) volunteers and long-time board members remember the summer of 1987 well. A 50-mile garbage slick, including medical waste, loomed off the New Jersey coast. After three days of closed beaches in August, the tourist season was essentially over for Long Beach Island (LBI). That’s the year ALO was founded in New Jersey’s LBI, and its mission of promoting and maintaining clean water and a healthy coastal environment was formally enacted. In response to the wash-up of waste, Ken Smith, an LBI insurance broker, led a group of concerned citizens to address the problem of ocean pollution. John Woodland and Karen Kiss, ALO’s first president, were also instrumental in the early days. ALO translated its mission statement into action by adopting a three-pronged strategy. Its activities to protect the oceans, beaches and bays focus on three areas: legislative action, educational programs, and local activities and individual responsibilities. Although the environmental issues have changed over the years, stopping pollution at its source is always the primary concern of ALO. Non-point source pollution (NPSP) is an elaborate term for pollution that starts at one point and winds up somewhere else. NPSP occurs when rainfall, snow melt or irrigation runs over land or through the ground, picks up pollutants and debris, and deposits them into rivers, lakes and coastal waters or introduces them into groundwater. Just imagine the path taken by a drop of rain from the time it hits the ground to when it reaches a river, groundwater or the ocean. Any pollutant it picks up on its journey can become part of the NPSP problem. Two of the main components of NPSP are debris and chemicals. Litter, in particular plastics, and nitrogen runoff especially affect the local area. In regards to chemical runoff, the primary concern is nitrogen. Though essential for plant growth, if too much nitrogen enters a body of water, it can lead to a condition called eutrophication. This can lead to harmful algae, decay of underwater plants and death of marine life. The environmental impact of plastic is untold, but there are a few undisputable facts as reported by www.riseaboveplastics.org: Eight out of ten bottles wind up in a landfill or the ocean. The Great Pacific Garbage Patch is a gyre in the ocean filled with pieces of plastic that is twice the size of Texas. In the Atlantic Ocean, there is an area estimated to cover the distance from Virginia to Cuba that contains billions of pieces of plastics. More than 1 million sea birds and 100,000 marine mammals die each year from ingesting or entanglement in plastic. In the Long Beach Island and local Barnegat Bay areas, ALO plans to head up a new environmental initiative to provide free re-mineralized and filtered water to anyone who wants to hydrate. The goal is to encourage people to refill bottles, reduce their use of plastics and prevent it from winding up in the ocean. Hydration stations need to be installed via the public water system, which is why Neal is working with each LBI town and some local businesses to secure spots for installation. The water will be controlled by a faucet and flow through two spigots, one cold and one room temperature. The plan is to have the water on from Memorial Day through October. For the last 18 years, ALO has conducted a cleanup in conjunction with Earth Day. During this time, the group and its volunteers have literally picked up tons of garbage. ALO is also the local host for the global International Coastal Cleanup, held every October in 152 countries and sponsored by Ocean Conservancy. Additionally, the Annual LBI Longboard Classic & Environmental Fair is going on its fourth year. The event features a surf contest for vintage long board riders and an exhibit by many other environmental groups. 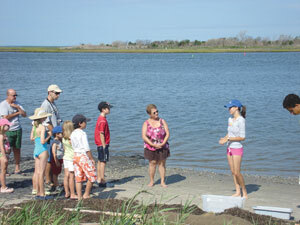 ALO hosts popular summer programs to educate the public about local environmental issues. Conducted by an ALO naturalist or an ALO Clean Water Leadership Program intern, family-oriented programs are offered three to four days per week from July to August. Programs include eco-kayak tours in Barnegat Bay where participants seine the bay and learn about marine life and a shore-themed puppet show called Sea Critter Roundup. Additionally, ALO serves as a drop-off location for the Recycle Caps with Aveda program. As the majority of caps are not recycled today, Aveda re-purposes them into new packaging. The group has collected thousands of caps since participating in the program in 2007. To become an ALO member or volunteer, visit Livingocean.org.